Here at Transpack, we offer a variety of high quality, great value clear polythene bags that are suitable for a wide range of applications. All our clear bags are food safe and fully recyclable. Our high-quality clear polybags are available in a wide range of sizes, from large, clear polythene bags to smaller sizes and are in three strengths from light to heavy, so you’re bound to find one that’s suitable for your needs. - Light duty clear polythene bags: The light duty clear polybags are designed to protect clothing, sweets, paper and similar items from dust. - Medium duty clear polythene bags: Our medium duty polythene bags are ideal for storing cables, card, cereals, pet food and electrical components. - Heavy duty clear polythene bags: Heavy duty and large clear polythene bags are ideal for weighty, sharper-edged products, such as nuts and bolts, hardware and large quantities of pet food. We supply clear and printed polythene bags in a wide variety of sizes, ranging from small polythene bags through to large clear poly bags, as well as in light, medium, and heavy duty options. If, however, you can’t find the right size for you, we also supply bespoke polythene bags and tailor made polythene bags for businesses. All of our polythene bags are recyclable, providing a more environmentally friendly packaging and storage solution, helping you to reduce your impact on the world around you. •	Please note that the measurements of our clear polythene bags can vary slightly due to manufacturing tolerances - Please ask for a sample if size is critical. •	All of our polythene bags are recyclable. •	If you can’t find the size you’re looking for or would like your clear polybag printed with your logo, our bespoke polythene bags could provide the perfect solution. •	If you’re unsure what sized polythene bags you require, please request a sample to try before ordering. 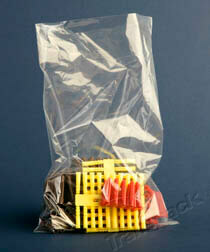 Can Polybags be used for food goods? Yes, all of our clear polythene bags sold within the UK are certified as food safe. This means they are great for storing or presenting sweets, confectionary, dried pet food and cereals, and any other edibles. If you require a Food Safety certificate, this can be provided, please request one when placing your order. Can I seal these polythene bags? If you need to seal your bags, our heat sealers will do the job. We offer wide variety of heat sealers, so there’s sure to be one that’s perfect for sealing your clear polythene bags. How big are Polybags? What sizes can I buy? Our range of clear polythene bags are available in over 28 sizes and three different strengths, so there’s sure to be one that meets your specific needs. 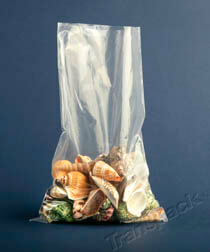 Of course, if you can’t find what you’re looking for, we also offer bespoke polythene bags. How thick are these Polybags? 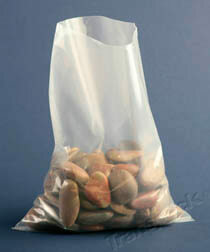 Our clear polythene bags come in three thicknesses, 100g, 200g and 400g. The (g) stands for gauge. Gauge is the measurement of plastic bag thickness, related to the SI measurement of microns. 4 gauge is equal to 1 micron. 1000 microns is equal to 1 millimetre. Our 100g bags are 0.025mm thick.